Cheran is a Tamil film director and actor, who has a reputation for directing and producing culturally strong films. His movies are characterised by their realism and the strong social messages that they convey. He has won the National Award twice, one for Most Entertaining Film in 2004 (for Autograph) and the other for Vetri Kodi Kattu (which won Best Film of 2000 dealing with social issues). Born at Pazhaiyurpatty, near Melur in Madurai district, Tamilnadu. His father made was a cinema (machine) operator and his mother was a school nursery school teacher. 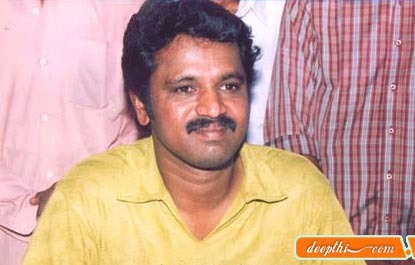 Cheran nurtured his acting skills by the stage dramas enacted in those days during local festival seasons. He went on grooming himself and his dreams by undergoing self-designed rehearsals by himself standing in front of the mirror, speaking out the film dialogues of Nadigar Thilakam Sivaji Ganesan, which he carried out with the accompanying acting gestures. He was worn out after he ran away from home to Chennai with dreams of becoming an actor. As his endless chasings after people and cinema studios for getting cinema chances proved to be failures, his hopes were shattered. At last, putting an end to his day-dreaming of becoming a film actor, he succeeded in turning his attention towards the other sides of film-making. He learnt the art of film direction under the mentorship of director K S Ravikumar. He earned the reputation of remaining a good film director capable of making quality films. This became possible only through his directional ventures, starting from Bharathi Kannamma to Paandavar Boomi. While directing Paandavar Boomi he demonstrated to the artistes how to enact their part. The film's cameraman Thangarbachchaan noticed this and identified the actor in him during such instances and introduced him as an actor in Solla Marantha Kathai. The people, on their part, have accepted him as an actor too. Cheran is a person who is against selling pirated VCD's. He conducted raid's in his own style to stop them. Cheran started out his career as an assistant to K.S. Ravikumar. The young man caught the attention of producer Henry. Henry is the producer of the Malayalam film 'Yavanika' directed by K G George. After that he made his entry in Tamil with 'Kolangal', a subject based on a girl rescued from the red light area in Mumbai facing social problems back home in Chennai. Henry who always insisted that the film should not only be commercial but also have a strong offbeat theme found in Cheran the youth who has a love story which would also stir up the public because it was loaded with some caste based attitude existing in Tamilnadu.